OH MY GOODNESS BLOOKUNITY*. 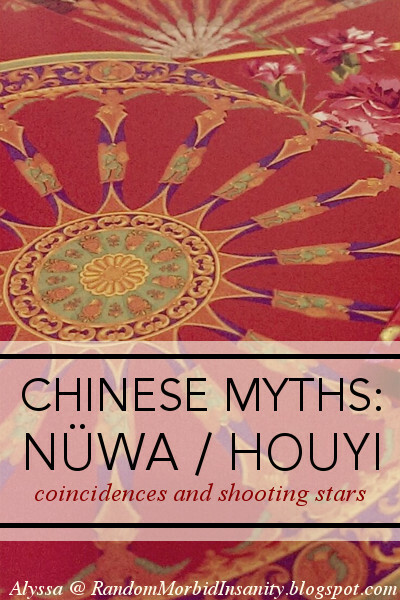 I can't believe I waited this long to share more Chinese folklore with you. I've talked about Mulan incessantly, but aside from that, this is a gaping hole in this series. This is unacceptable and we are correcting it at once. Today, we first have a little snark, then a little poetry, because takeout cannot afford to be dull. *blookunity (n.): the abbreviated form of book blogging community, as dictated by Alyssa. Enter Nüwa, one of the most important Chinese goddesses. In fact, until Buddhism and such entered China, I believe most temples worshipped her. Their reason? Nüwa created humans. There are several theories about this. The first is that Nüwa made some human-like figures from clay and somehow gave them life. 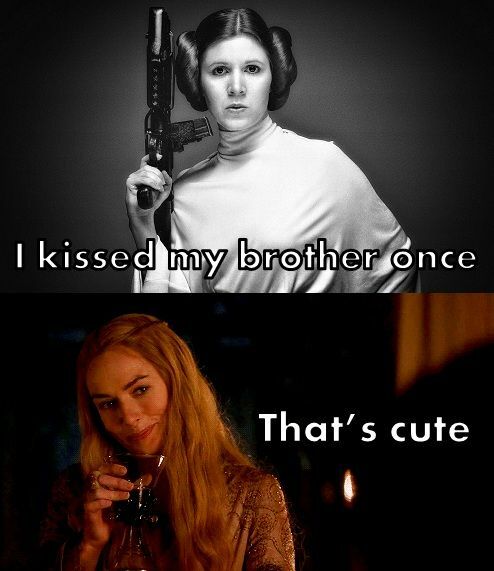 The second is that she married her brother and their children became humans. Which, you know, is probably what happened after Genesis, so I'm still wondering exactly how two creation theories with supposedly separate origins have come so close. A more romantic person might write a poem. A more cynical person, like myself, is still wondering about legalities. There's one last theory which I myself find the most convincing is that Nüwa didn't create humans herself. Instead, she enlisted the help of other deities to make various body parts, and failed for seventy times before finally succeeding. Divinity aside, the Chinese deities were by no means infallible, and this is why this theory seems most beautiful to me. Beauty is not in the perfection of the world, but rather in how we endure, and strive, and refuse to yield. Mind you, Nüwa didn't create the world — that was Pangu, who parted the heavens and the earth with his own body, which was later degraded to form the land and the rivers — but at some point, the skies were falling down and the seas were flooding the land. Here, Nüwa found the five-colour stones to rebuild the pillars of freaking heaven and mended the sky. Some versions say that Nüwa sacrificed her own life in the process, but it wasn't the snap of a fingers at all — she might have the might of a goddess, but even that did not move earth and heaven with ease. One last rumour about Nüwa—it was said that she had a body slender as a snake, or perhaps that she in fact had the body of a snake. Funny, isn't it, how these chimera-creatures are seen as monstrous in many Western cultures, but divine in this Chinese culture. once upon a time. there were ten suns in the sky. they were birds which flew in tandem to avoid scorching the land. but suns are only stars, and stars cannot help but burn. the sunbirds grew tired of routine, so they all rose at the same time, and scorched the world, a cage of rock and dirt that lay distant but was a cage nonetheless. and here enters houyi, our hero — you can decide in a moment, for yourself, whether he deserves the title. seeing the disaster wreaked on land, the god of archery grew wrathful and shot the sunbirds from the sky. as for the rest of us, only one sun graces our skies, a star close enough to call home. 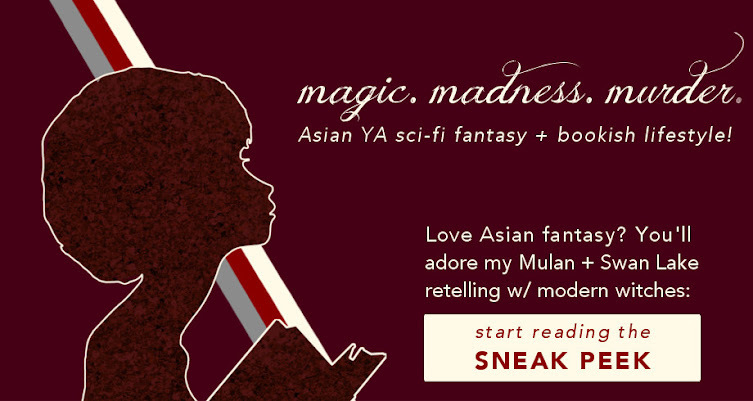 Interested in my Mulan + Swan Lake retelling? I share exclusive excerpts & fun discussions not seen anywhere else -- stay updated here! Stay updated on Alyssa's Chinese-inspired fantasies!